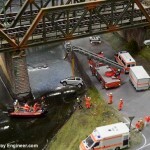 When it comes to tools for model railways, there are a thousands of tools to chose from. 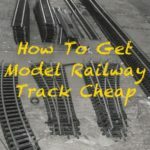 You don’t need every tool on sale in B&Q but old hands in the hobby recommend the following as the 17 essential tools for your model train work. What are you missing? 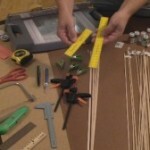 The knife in my toolbox is perhaps my most reached for tool for millions of odd jobs around the layout — from model and scenery work (cutting paper, card and plastic) to electrical tasks. Invest in a good one, with replaceable blades — you won’t regret it. Craft, DIY and model shops will all be able to supply them. For some problems only a hammer will do! Aside from “correcting” mistakes, pushing in track pins is one such problem and for which a small headed hammer will come in handy. Any good DIY store will carry a good selection of hammers. Tip of the hat to @stevethomas6444 for this one. Electrics are the lifeblood of your railway so a trusted means of measuring and testing current, voltage and resistance is a must. 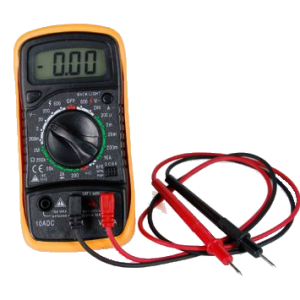 Any High Street DIY store and many model shops will be happy to sell you a multi-meter, alternatively, the DIGIFLEX Volt Testing Digital Multimeter is great value for money with has 250+ positive reviews. Vital to precise positioning of the many tiny elements on model trains and layouts and, let’s face it, for retrieving them when we drop them into difficult to reach spots needle nose pliers are just ideal. The biggest use however, for me at least, however is probably feeding wires through holes in the baseboard and under track, bending piano wire for Tortoise and Colbalt point motors. They’re also useful for inserting and of course removing track pins. The Am-Tech Mini Extra Long Nose Pliers detailed here are highly rated. While I use my Dremel for most rail cutting, a pair of rail cutters (under £15 via Amazon) are handy to have around. The Xuron track cutter (details here) for HO, 00, N and Z Gauges are well regarded. As soon as your railway moves beyond “toy” and temporary table top construction and you start getting serious a soldering iron will be needed. A 25W or 30W soldering iron is vital, any smaller and the iron won’t heat wire and track quickly enough and bigger irons will likely melt your rails. You’ll also want one with an exchangable different size tips for the different tasks around the layout. Antex is easily the most recommended brand and the Antext 25 is my preferred choice. See my guide to soldering which takes you through the different irons, how to solder and which solder mix to use for the best results and avoid bad joints. Kudos to @tanj666 for suggesting this. Good scissors, of different sizes, are an essential in your tool box for model railways. This 5 piece set is highly recommended for everything from cutting card (scenic walls and adjusting Metcalfe cardboard buildings for instance) to cutting ballast and grass matts. Power drills save a lot of effort especially around construction of the baseboard, drilling holes for wires to point motors, signals and lighting. I’ve recently changed my preferred electric screw driver and drill, upgrading to this 18V Li-Ion Fast Charge Cordless Drill/Driver (pictured). 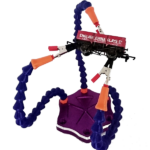 It’s variable speed with 24 torque setting, comes 13 accessories, built in light and level bubble and at the time of writing is available at 50% off from Amazon. To be honest this is one I didn’t realise I needed until reading about, getting and then using it and I still can’t believe it didn’t have one for so long. You can’t go far wrong with any straight edge ruler but this one gets rave review if you can’t find one locally. When first starting out with models, it’s easy to try and get by. One example of this is when applying liquids – glues, oils etc. It’s all too easy to try and do this with brushes or even trying to drip fluids into place only to get glue or paint splashed over building fronts or tracks which can be a pain to remove. Since learning the hard way I now always use fine point or pin point syringes to precisely deposit fluid and haven’t looked back. The few pounds that sets such as these cost won’t be wasted. #11 Cutting Matt While not strictly a tool, if you’re doing any kind of cutting (and you will) having a surface on which to work without slicing up the family table or kitchen worktops is a good investment. Cutting matts are available from most craft shops and eBay. This idea came from the Natfka blog for diorama’s but it’s a goodie. Look for dental sets, such as this kit via Amazon, as they contain several tools which are often needed for modelling and will be cheaper than buying them separately. 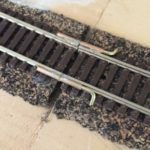 For model railway modelling, look for sets containing picks – ideal for adding fine weathering or precise positioning – and most also contain mirrors which are handy for getting into tight corners to identify problems (under bridges etc). For cutting material to thick or strong for craft knife and scissors a good hack saw is a must. Whether it’s track cutting, slots for wiring or delicate adjustments to models having a good hack saw will make life easier. Big and small screw drivers are easily an essential in any tool box. For model trains, you’ll want a selection from a typical precision watch makers/jewellers screwdrivers set alongside a standard electrics set such as the Stanley FatMax Screwdriver Set. Is a brush classified as a tool? I don’t know but do know I regularly find myself reaching for a brush of one size of another. You’ll want a a wide and varied selection, for painting buildings and weathering to fine positioning of ballast. You’re local craft store will have a wide selection. When buying tweezers, avoid the budget tweezers as these are poorly made from cheap metal and prone to bending or not meeting at the tips. Spending a bit more will save you time and money in the long run. 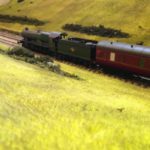 From building kits to fixing flexi-track and underlay to adding bulk to do-it-yourself made trees a glue gun (Melt Guns) makes life easier and faster for model railway hobbyists. One tip from experience: Get a gun – such as this one – which has two heat settings so it can be used on both sensitive surfaces like thin card and more robust materials. For small high precision drill work nothing beats a good quality Pin Vice. Able to hold very small scale drill bits (.3mm for example) bits while also giving precise control of the speed of rotation so as not to damage delicate materials you’ll find it becomes one of your most used tools. I use a Modelcraft Pin Vice for detail work and the Rolson Archimedean Drill (pictured) for bits over 1mil. 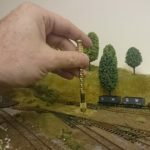 So what tools could you not do without when working on your model railway? Share your suggestions in a comment. In addition to painting models it is a very good idea to keep a 1″ / 25mm Soft Bristle Brush, as used for decorating. This can then be used to clear dust from your models in a quick and easy way. 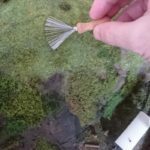 I also have a couple of brushes like those used to paint models, which I keep to allow dust removal from areas which are not easily accessible using the 1″ brush or are delicate and require more precision. This is great for Engines and Rolling Stock, Kits, Resin Castings, White Metal and Diecast Models, alongside many others. Where doest the dust come from in a clean room? I couldn’t imagine my “toolbox” without needle files. I also often use the “tool” intended for manicure, e.g. sanding paper on hard cardboard (your girlfriend or wife’ll know what I’m talking about). One more tool I find very useful is a sharp needle – I use it for making starter holes for drilling in plastic, especially with bits of under 1 mm in diameter. Hope you keep enjoying the hobby for many years to come, and keep up the good work! Thank you.